Our Constitution states that “no one may be evicted from their home, or have their home demolished, without an order of court made after considering all the relevant circumstances. No legislation may permit arbitrary evictions.” The Constitution further provides for everyone’s right “to access to adequate housing” and sets out the State’s obligation to ensure this right is upheld. In this way, the Constitution attempts to balance the rights of landowners and occupiers and redress historical inequalities. Enter the Extension of Security of Tenure Act 62 of 1997 (ESTA), which guarantees basic human rights for farmworkers and people living on someone else’s land in rural and peri-urban areas. Historically, these people do not have secure tenure of their homes or the land they use and are vulnerable to unfair eviction. In terms of ESTA, if you have lived on someone else’s land with their permission, you have a legal right to remain there, and the owner cannot change this without consent unless there is a good reason to do so. ESTA aims to ensure long-term security of tenure, prevent unfair and arbitrary evictions, and encourage the government to assist occupiers and landowners to find long-term solutions to disputes involving occupation of land. ESTA applies to people in rural areas, living on farms and undeveloped land that is not part of a township. It also protects those living on land surrounded by a township or township land earmarked for agricultural purposes. Male and female occupiers have equal rights under ESTA. ESTA applies to people who reside on the land with the express or tacit consent of the landowner or due to another right in law (such as the widow of an occupier) and earn less than R13 625 a month (increased from R5 000 a month in February 2018). If you were living on someone’s land with the owner’s permission on or before 4 February 1997, you have a right to remain on that land and the owner cannot amend or cancel those rights without consent, unless there is a good reason. You also must be given an opportunity to answer any allegations against you. You are entitled to receive visitors, have your family live with you, enjoy access to water, health and education services, and receive post and other forms of communication. Note that family members do not automatically become occupiers in their own right. The Act gives people the right to visit and maintain family graves, but this must be balanced with the owner’s right to privacy and reasonable conditions should be agreed. “Long-term occupiers” (people who have lived on the land for 10 years and are over 60, or people who become disabled or sick while employed by the landowner) can stay on that land for the rest of their lives. Their rights can only be terminated if they intentionally harm or threaten anyone else occupying the land or deliberately damage property. The Land Claims Court and the Magistrate’s Court have jurisdiction in terms of ESTA, although, if the parties agree, proceedings can be instituted in any division of the High Court. What if your income exceeds the qualifying amount? 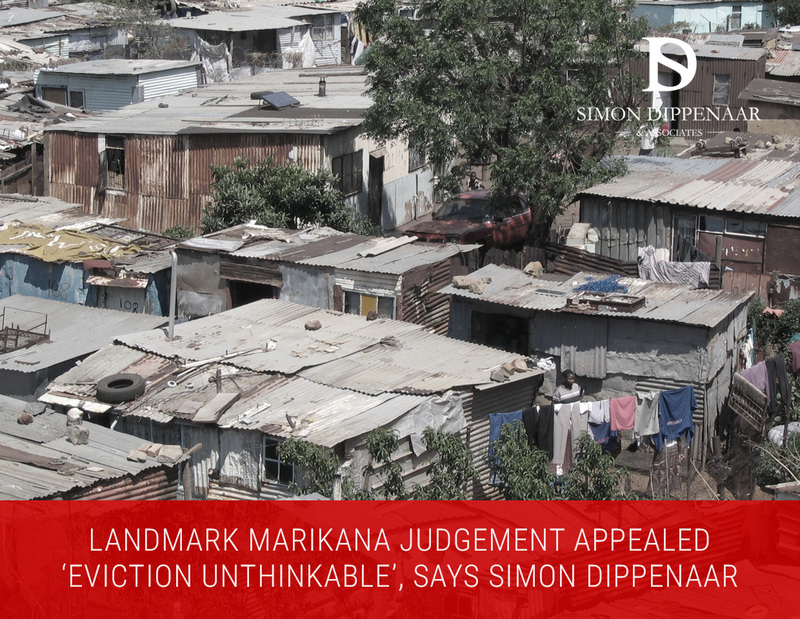 Even if an applicant’s income exceeds the prescribed qualifying amount, the court may still rule that an eviction is an infringement of rights in terms of section 26(3) of the Constitution, as it did in the case of Mahlangu & Others v Lanseria Commercial Crossing (Pty) Ltd & Another. The court declared the eviction unconstitutional and therefore unlawful. The Prevention of Illegal Eviction from and Unlawful Occupation of Land Act (PIE), discussed in this blog previously, pertains to unlawful occupiers of residential land. In contrast, ESTA deals with the eviction of lawful or previously lawful occupiers of rural or peri-urban land. Even if someone is evicted from non-urban land and is consequently deemed an unlawful occupier in terms of PIE, the eviction is still dealt with under ESTA because the land in question is non-urban. For example, in Agrico Masjinerie (Edms) Bpk v Swiers, an occupier had consent to live on land as defined in ESTA, voluntarily vacated the land, and later reoccupied it without consent, thus becoming an unlawful occupier in terms of PIE. The court found that ESTA still entitled the unlawful occupier to apply for restoration under ESTA. Additionally, an occupier’s right to live on the land relates to the entire unit of land, and not to a specific area or house. This means that if a landowner wanted to relocate an occupier to another place on the same land, ESTA would not apply. Interestingly, a smallholding in a township is not regarded as agricultural land for the purposes of ESTA and does not fall within the ambit of ESTA. In the case of Schaapkraal Community v Cassiem, the court ruled that smallholdings are designated for rural residential use according to the Cape Metropolitan Area Guide Plan of 1998, and no law designates smallholdings for agricultural use alone. As a landowner you must legally terminate the occupier’s right of residence by giving two months’ notice and inform the relevant municipality and Department of Land Affairs of the intention to evict. A legal termination would include the ending of a lease agreement or a fair dismissal. This notice of motion and supporting affidavit is served by the sheriff of the court. A probation officer from Land Affairs will be appointed to draft a report, which the court will consider in determining whether or not to evict. The occupier has an opportunity to oppose the eviction and file answering papers. The court will then set a date for the matter to be heard. Property owners and occupiers alike have rights under South African law and it is important for everyone to receive fair and just treatment. Unfair and unjust evictions are fortunately a thing of the past. SD Law & Associates are property and eviction law experts. We have an intimate knowledge of the legislation and can make sure your rights are protected under ESTA, whether you’re a landowner or an occupier. If you’re facing an unfair eviction or if you’re considering evicting someone and need to serve an eviction notice, we can help. Contact Simon on 086 099 5146 or email sdippenaar@sdlaw.co.za. For about Simon Dippenaar click here.